Sedona’s famous red-rock landscape offers adventure at every turn. Experience it for yourself with off-road tours that wind through the signature scenery in state-of-the-art Pink® Jeep® Wranglers. Each excursion offers an unforgettable backcountry trek with insider info from the area’s most knowledgeable and experienced local guides. Immerse yourself in a true Sedona experience with one of our Pink Jeep Tours combo tours. These adventures combine our premier off-road experiences with fun activities like hiking and history. You’ll have opportunities to get up close with the rugged beauty of Arizona on four wheels and your own two feet. This is where your trip truly begins. Please arrive at least 15 minutes before your scheduled departure time to meet our guides and get a few quick tips before climbing aboard your Jeep. Stop in to grab a snack, water or sunscreen before your tour. Come back after your adventure for a Pink® Jeep® Tours shirt, hat and memorabilia to commemorate your day out. Reserve a tour, check in for your adventure and go over the final details. 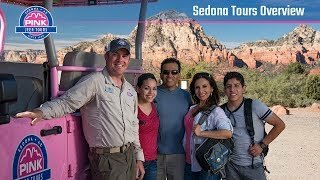 As Sedona’s most knowledgeable guides, our team can steer you to top eateries, attractions and accommodations. Treat yourself to coffee, tea and light bites while relaxing on a patio with red-rock views. Our trained baristas will make your drink to order and serve it up in eco-friendly cups.